Mr. Renaud is the founding member and currently President of the National Alliance for the Advancement of Haitian Professionals (NAAHP). His primary vision for the organization was to help its members find synergy between career advancement in their chosen field, philanthropy, and social entrepreneurship as a means to engage in Haiti’s ongoing rebuilding development efforts. Since its inception in 2011, Mr. Serge’s leadership has helped the NAAHP membership triple year over year. His relentless negotiation and relationship building skills have led to collaborations with local and national civic leaders, members of the USAID, Embassy of Haiti and Haitian prime ministers and Heads of State. The NAAHP has earned many commendations under his leadership from congressional leaders, City of North Miami, and the New York State Assembly. 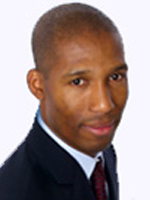 Mr. Renaud is a founding member of the New Jersey Haitian Student Association (NJHSA), a current Board Member of the Haitian Association of Indiana (HAI), and a former Board of Directors of the Haitian American Leadership Council (HALEC) – NJ Chapter. Mr. Renaud graduated with a Master of Science in Accounting from Seton Hall University; an MBA in Management of Technology with a focus in Finance and a Bachelor of Science in Management from the New Jersey Institute of Technology.